Latest update from a busy week. We are on our way home from Mubende currently. I have given you updates on our two incredible days in Kachangwa on Wednesday and Thursday. We spent Friday in Mubende at Jabez Nursery and Primary school. We did health screenings on 330 of the cutest kids you would ever hope to see. Jake, Jared and Jessica have gotten very familiar with the pharmacy. They really enjoy the lab, but there was not much lab to do on this trip. So they have spent the time gaining more skills that will serve us well the next few months. Friday night at the hotel, a thunderstorm came in about 30 minutes after we got back. It chased us into our little rooms, and of course, knocked out the power! The power was still off when we packed and left via flashlight this morning. Today, Saturday, we spent in the village of Muleete. This was a free clinic open to the village. We saw about 300 of the friendly village people today. This brings our 4 day total to over 1,250 treated by the Due Unto/Africa Renewal Ministries team. We had to restock on some medicines each day and our supply is overall pretty low now. This week is the kind of medical work that I felt God calling me to in Uganda. The rural people of Uganda are so gracious and appreciative of what we do and they have a significant need for health care access. I think that we will try to stick to more 3 day trips in the future as the 4th day of seeing so many patients has left us pretty worn out. Early next week, Jill and I will be meeting with the leadership of ARM to map out our schedule for the next few months. We will do some more full on clinics like this week, but we will need to spread them out some because they use a lot of resources quickly! I debated about if I should share this or not, but I think that it is too funny not too share. It is somewhat gross, so I apologize in advance. Friday night, we took our Doxycycline capsules like we always do after dinner. We take this for malaria prevention. It can upset your stomach, so we take it after our evening meal. It can cause some skin rashes when you are exposed to the sun, so we take it late in the day, so the peak is at night while we are asleep and out of the sun. Anyway, as I took my capsule, it felt like it stuck in my throat. So I kept drinking water trying to get it to go down. Well, eventually, I burped and this doxycycline “dust” came up my throat and into my mouth. I think some spewed from my mouth like a Sevin Dust sprayer. My eyes watered and I coughed and sputtered to the point that Jake almost gave me the Heimlich! I finally recovered but woke in the middle of the night with my uvula (hangy down thing in the back of your throat) on fire! I thought that I was getting strep throat, but it was gone by morning! I think that I will stick to the tablet doxy from now on! We are off on Monday, so I will try to update more then. It is now Thursday night in Mubende Uganda. We have power at our hotel, for now, but not water. (This is Jill, and while I began reading this blog to proof it, we now have no power as well.) It went out in the middle of showers this evening. Today, we went back to Kachungwa for our second day of clinics there. We saw another large group of people ending up with 640 patients seen over the two day period. We found out that the family of the little girl that passed away was having a burial ceremony for her today. We found someone to direct us to their home. I kid you not, that we drove for 30 minutes on roads that I am sure an automobile has not been down in years. We got to a point that I asked our driver not to drive any further. It looked like it could rain and I was sure, that if we went further, we’d get stuck in the middle of Nat Geo Africa as it got dark. It struck us how far this family had traveled to our clinic yesterday. We had told them to go home and come back at 5:00pm, but there is no way that they could have gotten home and back in that amount of time. It had to be 8-10 miles. Pretty soon after our lunch break, I heard Jill say in a concerned voice “Jay?”. I looked up from the patient that I was treating to see 3 men carrying in an unconscious man. They laid him on a wicker mat at the front of the church that we were working in. It reminded me of the men lowering their sick friend through the roof to see Jesus. Not that I am comparing myself to Jesus, but the men helping their friend to get care. This was Paul. He is 34 years old, speaks English but is barely conscious at my initial exam. He had a good pulse but it was fast. He felt VERY hot and had a temperature greater than 102. He had been sick for a few days and actually had started malaria treatment through our clinic yesterday. We quickly got an IV started and gave him IV rocephin (an antibiotic for pneumonia) and a shot of malaria medicine. I tried to sit him up to take some tylenol and he almost passed out again before he could swallow them. We watched him in our clinic for a few hours. His fever came down and he was able to walk again. Here I was thinking about how we get him to the hospital and it turns out that we were doing everything for him that the hospital would do. Obviously, I am having to adjust my thinking of hospital vs no hospital. I was just a little gun shy after the death yesterday. Paul was REALLY sick, and could very well have died with out intervention. God used us to help him today. He is actually an associate pastor at the church in Kachungwa. We (Africa Renewal Ministries) are helping this lady to get some care. 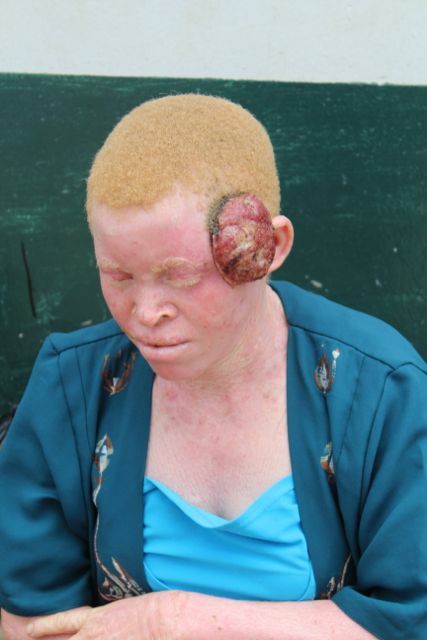 She is an albino and has no pigment in her skin. She has a very large skin cancer growing on the side of her face. She was going to the National Referral Hospital today with funds provided by ARM. Please keep her in your prayers. I saw a boy named Innocent today. He is 17 years old and weighs around 65lbs. He looks like he is about 10! He has a VERY large spleen and is likely chronically ill from malaria. His family has no way to get to medical care. His problem is not considered an emergency, so if we sent him to the hospital today, they would have sent him home to return another day. 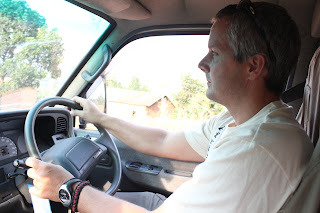 You are not going to believe this, but I drove home to Mubende today! The van has the driver seat on the R side and we drive on the L side of the road. This is a little confusing, but I think that the only problem I had was trying to use the signal on the L side of the steering column. Their blinkers work from the right side. My passengers were not concerned at all!?!?! We have run out of some medicines. We are hoping to restock on malaria medicine by tomorrow. We will be running a children’s clinic in Mubende (different location) tomorrow. Thanks for all of your prayers and continued support. Let me give you a little update on the Due Unto team. We spent Monday sorting, packing and ordering our supplies for a 4 day rural health care trip to Mubende. We also got our van (FINALLY) off of the lot. She is a beaut! We’d like you to help us name it. Our van is a 1994 Toyota that has been reconditioned and we are the first owners to bring it on to Ugandan roads. It had lived previously in Japan. It is a diesel and smokes a little going up hills!! When we get back to Kampala, next week, we will get the top rack, seats and bota bars. Tuesday, we set off on a 3+ hour trip towards the west. We are spending 4 nights in Mubende and working medical clinics in different directions from here. Our hotel……well, it makes us appreciate our apartment in Kampala. Last night, the power went off, right after we arrived, and came back on at 5:00am this morning. After breakfast, we set off to Kachungwa to run a medical clinic. There is not a medical facility close to this village. The last time that Africa Renewal Ministries operated a clinic in this community, they took 14 doctors and 20 nurses and saw 700+ people in one day. We had some worries as we thought that after it was announced that a medical team was coming, that they would anticipate the same big team, and we did not have near that many. When we finally bumped our way across the dirt roads to reach Kachungwa, there was a line of people waiting on us, as expected. I was not aware of it, until lunch, but the local team had identified a 3 year old girl that was quite ill. They asked Dr Martin to see her while we started unloading medical supplies. Dr Martin gave her a shot of malaria medicine and asked the father (mom was not present) to take her home and to return at 5:00pm for a recheck. Well, the family just hung out around the clinic all day. We did not realize this among all of the commotion. So the child had not had anything to eat or drink all day. When they returned at 5:00, the child was rushed (in our new diesel van) to the regional hospital in Mubende. Our driver, David, obtained info from the father that she had been sick for 2 weeks and had not gone for care because of lack of money and no way for transportation. After a long day of clinic and seeing around 475 people, we headed back to Mubende and our hotel. We stopped by the regional hospital to check on the little girl, on our way home. The “ward” in this regional hospital reminded me of barns that we showed pigs in when I was in high school. Not the fancy ones like the one in Duncan, but the cruddy ones like in smaller towns. There were probably 50 kids stacked in beds closer together than bunks at Falls Creek cabins. All of these kids with IVs, and looking quite ill. That shocked me. Honestly, this is now my 6th week (total) in Uganda in the past 13 months, and I was not ready for it. This whole scene was not OK with me! Some conversation went on as we walked into the ward. I did not understand what was said and I was in shock. It was then told to us that the child had died, shortly after David had dropped her off. This hit our family really hard. We have celebrated God’s healing of Eddy and Jonathan over the past week. We were ready to celebrate God’s handiwork again, but we, instead, received a kick in the gut. We began to wonder, what could we have done differently? What do we need to add to our medical van? Our kids have been around death, with our ranch. But they have been blessed to not have a lot of death of close relatives. This is very hard on all of us. One of the hardest parts of my ER responsibilities is telling families that their loved ones have died. I have received training in this and I have been told that I do this well. I am not sure that is a complement and I know that I would almost rather do anything than to have this conversation with someone. I have experience with sick, death and dying but most of us do not. Please keep this child’s family in your prayers. They were likely given their dead child back and then had to find a way to get home (probably 20 miles away). Please keep our family in your prayers too. We are headed back to the same village tomorrow with a more keen sense of the physical and spiritual life and death battle that we are facing every day. There is a celebration in the same area as Kachungwa. A team, from Camby Christian Church in Oregon, is staying at our hotel and doing some work in the same village. They were able to speak in a school yesterday and saw 153 young people accept Christ in one day!!! Another reason that they are in the area is because they feel that God is calling them to build a medical clinic in Kachungwa. What a day for them to see the need! Over the next few weeks I would like to introduce you to some of the Ugandan Members of the Africa Renewal/Due Unto Others team. The first team member that I would like to profile is Joseph. He is a “clinical officer” here in Uganda. That is a position that is very much like a PA or Nurse Practitioner in the US. On one of our first days of meeting with Africa Renewal Ministries, Dr. Martin mentioned Joseph. He had recently become available from the clinic where he had been working. Martin really wanted to hire him at Wentz Medical Center but did not have a position or funding. Joseph is a good Christian man in his 30’s. He and his wife are celbrating the arrival of their first child yesterday. I asked Martin how much it would cost to have Joseph help us on our missions as we go out to rural areas in Uganda. He said that he thought that he could hire him for $600/month! God just overwhelmed me with the sense that we could double what we were going to be able to do for $3,600 for the whole 6 months. I asked Martin to go ahead and see if Joseph was interested in the position. Thankfully he was. Joseph reminds me some of Johnny Terry. Johnny was a PA that worked in Urgent Med for a couple of years. Joseph, like Johnny, is a little quiet, very easy going and has a great big easy smile. I am sure that many of you (Jamie Slate included) remember Johnny. I am excited to think that we will be able to see twice as many people on or mission trips because of this addition to our team! If this was not enough, I think that I am more excited to think that he will be able to lead the team to carry on the work once we have returned to Oklahoma. This will require ongoing funding, but we will cross that bridge when we come to it. Next profile will be of David. He is a man of many hats. He will be our driver, translator, video/photographer and will helping us do some videos or documentaries over the time that we are here. Thank you for your continued prayers and support of our family while we are here in Uganda! a LOT of water & some of it HOT! I have several praise reports to bring you today, related to water. 1.) I want to send out a big THANK YOU to all of the prayer warriors that petitioned our God on the behalf of Jonathan. I asked for prayers for him on Monday afternoon. He had suffered a severe burn on his right arm and on the right side of his abdomen when he pulled a pot of boiling water on to himself the week before. I was concerned, at that time, that he could get a complicated infection or get scarring on the right elbow that would hinder his use of the arm. We stopped by to see him on Thursday, and he was still holding his right arm bent. The bandage was dirty, but he continued to run and play and smile. I was still concerned, at that time, about his scarring and function. We took the time on Thursday to pray with Jonathan and his mother again. I know that you have been praying, and given the results, I think that my Granny Due has been praying for Jonathan pretty intensely! ;] After a great worship service at Gaba Community Church this morning, we stopped to see how Jonathan was doing. I'd have to say that what I saw today was a miracle. Today, he can fully extend the arm, the burn on his arm and abdomen are almost completely healed. He probably could lose the bandages and be fine! We had asked God to heal him in a way that no one else could take the credit. Done! 2.) This one pales in comparison to the story of Jonathan. But we have been "suffering" in our apartment with no hot water for the past week. Since we got home from Hoima, late last Sunday, we have had no hot water. The apartment complex had switched to a solar system that I think consisted of a magnifying glass and a couple of mirrors heating the water! Anyway, after taking really quick "polar showers" this week, the apartment complex went back to the energy inefficient way of using a water heater and electricity to heat the water. Praise the Lord for hot water! 3.) It is coming to the end of dry season. When we arrived 2 weeks ago, it had not rained in Uganda for a month. Over this past week, we have had a few small rains. Last night, it started to thunder and lightning like a bad thunderstorm in Oklahoma. Today, there was hail and much rain. To quote the great American philosopher Will Smith it "Got Jiggy with it!". Normally when you look to the North of our apartment, there is a swamp/marsh area. Today it is a river. This picture shows the water from the marsh/river coming through the wall of our apartments and almost up to the building itself. Uganda has been needing some water, so this too is a praise for the water! This week, I worked in the lab at Bethany Clinic. I diagnosed malaria, tested blood sugar, performed HIV tests, and prepared blood slides. Prior to my week at Bethany, Jared and I trained in the lab at Wentz Medical Center. Gilbert, the lab technician, taught us how to find malaria parasites with a microscope and how to preform tests for HIV, blood sugar, and urine analysis. The team I worked with consisted of Andrew: 2.5 years of lab experience and lab technician at Wentz, Jared: 2.5 hours of lab experience, Jessica: 0.0 hours of lab experience and frightened by needles, and myself: 2.5 hours of lab experience. Our small team would need to adapt quickly and work hard in order to serve the people of Bethany. On day 1 of the medical mission, the lab was not operational due to a lack of manpower and supplies, so I will not talk about it. Day 2, we had a microscope, 100 HIV test strips, and butterflies in our stomachs; we were ready to face the onslaught of patients lined up in front of us. Initially, Andrew did a lot of the work while Jessica and I watched. Andrew told me to look at the blood slides for malaria while Jessica learned how to draw blood. I would check a slide and tell Andrew if it was positive or negative; he would then double check to make sure I was correct. Jessica was very nervous on her first blood draw (understandable because any of the blood we were working with could be HIV positive), but she was soon drawing blood like she had actually been to medical school. After lunch, Andrew told me that he would no longer double check me on malaria slides ( I was so afraid that I might miss a parasite and give a false negative, and a false negative would deny treatment and possibly kill the person I was testing). After an entire day of stress and fear, I found one case of malaria. Finding this malaria reassured me that I had been diagnosing people correctly and was a major boost to my confidence in the lab. The final tally on day 2 consisted of 5 positive HIV tests and 2 cases of malaria. On day 3, we arrived with more confidence in our ability to work as a team. This new-found confidence allowed us to hit the ground running and we began work immediately. Jessica drew blood, Jared did finger pricks, and I worked on malaria slides. By mid morning Jared and I learned to draw blood and Jessica could find malaria with a microscope. Our team gained a large amount of experience and the work we did renewed my interest in the medical field. The final tally on day 3 was: 2 HIV positives and 4 malaria positives. I personally would like to thank the lab team for their hard work and courage while facing the risk of infectious disease. I want to say thank you to all of our supporters in the United States for all of their support through prayer and financial aid. Thank you for helping to provide medical care to over 400 people. This has been an incredible week for the Due Unto Others team! You have heard a little about the week from Jill’s post regarding “Time”. Let me start, though, with our Monday. We joined the Africa Renewal Ministries (ARM) team at the ARM headquarters Monday morning. We loaded several big and heavy boxes on a boat and set off across Lake Victoria to Bethany Village. ARM has a school, orphanage and medical clinic at this location. On Monday, we unloaded our supplies and started into a health screening program for the kids in the school. 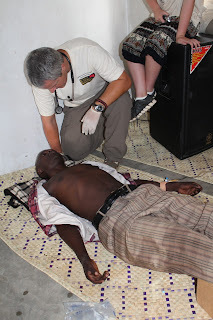 Medical providers included myself, Dr Martin and Joseph who is a “clinical officer” (much like a PA or ARNP in the US). We saw about 85 kids that day. We saw several kids with Ring Worm type infections and intestinal worms but not any that were horribly sick. We got stuck in a traffic jam on the way home and did not get home until about 7:30pm. On Tuesday, Joline, Jessica, Joshua, and Jennifer Gash went with us as we boarded the boat at the ARM headquarters and crossed the lake again. On this day, the clinic was opened to the Bethany village at large. Jill, Jared and Jennifer manned the check in station, giving the patients de-worming pills, and getting their weights. Jake and Jessica worked in the lab. They learned quickly from the lab tech, Andrew, and by the time the day was over, they were drawing blood and looking at malaria slides under the microscope. Joshua and Joline worked in the pharmacy, dispensing prescriptions to the patients with the help of Moses, one of the local nurses. Jayne helped me a little and helped with patient flow from the exam rooms to the lab and to the pharmacy. We saw 150 patients on Tuesday. The sickest of these was a 35 year old lady named Jane. She had a 104 degree fever and just looked “ill”. My sick radar went off pretty quickly with her. Turns out that she had a new diagnosis of HIV. I was able to pray with her and counsel her about this, along with my new friend, Faith, from ARM. Jane told us that she was born again, but had “grown apart” from Jesus. She made a rededication of sorts that day and we reinforced with her that all she had to do was ask for forgiveness and it would be granted. Jane was started on Bactrim and vitamins. We also encouraged her to bring her children the next day to have them tested. We were pretty tired as we headed home on Tuesday, but encouraged by the lives that we had touched and the wonderful people of Uganda who had shown us much love and appreciation. Wednesday, our same US team boarded the boat and headed for Bethany Village. We were a little tired from the two previous long days, so Jill needed her fix for the morning! The medical provider team changed a little, as we had Dr Joy, Joseph, myself and a clinical nurse on the team. Henry, Jim's friend that he helped to free from a remand prison here in Uganda went with us. He is wanting to be a doctor some day and he did an excellent job serving as my translator. We knew that we were in for a busy day as when we arrived, the whole porch area was full of people and the line stretched out onto the grass. I guess the news that we were there had spread around the village over night. Our team switched jobs a little as Jill moved to pharmacy and Jared joined Jake and Jessica in the lab. By the end of the day, Jared (at 12 years old) was drawing blood and running lab tests under the supervision of Andrew. On this day, we saw about 230 patients. Thankfully, Jane (my patient with HIV from the day before) was feeling better and all 3 of her kids tested negative for HIV. I met 2 other ladies, Justine and Margaret, that had new diagnoses of HIV at ages 30 and 37. I was able to pray with them and counsel them (with help from Faith again) regarding their illness. They too were started on medicines. I met a 10 year old boy who was very thin, but his abdomen stuck out quite a bit. I could feel his spleen and liver with him STANDING. For those of you not in medicine, it is very rare to feel a spleen. Usually when you do, a person is thin, laying down and exhaling. His liver was also enlarged, hanging about 2 inches below the edge of his ribs. This is likely a result of malaria. He appeared pale (noted by looking at the inside of his eyelids and lips to judge his paleness, because the dark skin is tough to differentiate). His mom had a goiter (mass on her thyroid) that I could see across the room. I was able to make referrals for them to head across the lake to be seen and have lab tests done at the Wentz Medical Center associated with ARM. I was able to pray with them as well and encourage the mother to make her follow ups that were arranged. All together, Monday-Wednesday, we had seen about 450 patients through our clinic in Bethany. The kids had learned many new skills that will serve the Due Unto Others team as we go out to other rural areas. We have been able to participate in the lives of 450 people, but they have made an even bigger impact on ours. Thursday was a great day. We slept a little later as we have not had an official “off day” since we got here on February 3rd. The Gregstons plus Jessica Gash joined Faith to cross the lake one more time. This time, we would come unannounced and do some home visits to people that we had seen in the clinic this week or that the local nurse knew needed some attention. We loaded backpacks with supplies and trekked out some dirt roads to find mud huts with people living there. The first place we went was that of a woman, Florence, with HIV. She had not been taking her HIV meds because she had not been able to go across the lake to the city to get her medicines. She seemed to be doing ok, but her 2 grandchildren were there. One, named Eddy, was laying on a mat in the front of the hut and looked listless. One feel of his skin, I could tell that he had a fever. Again, looking at the inner eyelids, he seemed anemic. We negotiated with the local nurse, Christine, to take Eddie back with us to Gaba when we left later that day. We knew that he needed to be checked out at the hospital and possibly get a transfusion. Arrangements were made for Florence and Eddy to meet us for lunch and then to ride on our boat back to the Wentz Medical Center in Gaba. We met an older lady that had fallen 1 year ago. Since that time, she has been unable to walk. We had seen her at our clinic on Tuesday. She gets around by dragging on her bottom and pushing with her hands. We had hoped to bring her an “off road” wheelchair, but it was not ready to bring until tomorrow. She will get it later next week. Her left leg was shorter than the right and her L hip causes her chronic pain. I am sure that she broke this hip a year ago. She was unable to get it fixed, so she can no longer walk. We prayed with she and her family and tried to encourage them. We met a man named John Baptiste, who is in his 50’s, but seems to have Parkinsons. His tremors keep him from working, so he now lives with his 17 year old son who tries to support them through fishing. While we were visiting with John Baptiste, he accepted Christ and prayed a prayer of salvation!! We went by to visit Jane. She was feeling much better with her fever gone. She was quite appreciative of the care she had received and was planning to start her HIV treatment in the coming week. In total, we went to 7 homes and we were able to share the love of Christ and pray with the people at each home. After lunch, we headed back to Gaba on the boat. Eddy and Florence did go with us. Eddy had a very high malaria count and a Hemoglobin of 6.0! Again for the medical novice, his Hemoglobin should be 11-14. The rule in Uganda is that you transfuse if less than 6.0! So he did not get blood, but did stay in the hospital overnight getting IV fluids and IV malaria meds. He will go home soon and get continued injections of malaria medicines in the clinic at Bethany Village. This week has been exactly like what I felt God was calling us to in Uganda! That is, helping people in the rural areas that would otherwise have no access to healthcare. I am not sure that Jane or Eddy would have lasted much longer without some medical intervention. Those of you supporting us in various ways, add the names of Jane, John Baptiste and Eddy to a list of people that will be giving you a big hug and thank you some day in heaven! Here is a fun update for you. The Gregston team has taken new names since we arrived in Uganda. In Uganda, people have Africa names and “Christian” names. In fact, they really don’t have family names. It is a little confusing because everyone in the family has different names. For example, our host is Dr. Nkundeki Martin. So here is Team Gregston and our new names. Kabalagala (Pancake) Jay I chose this because I like to say it real fast. Ekisa (Grace) Jill Given to Jill by one of our drivers. Secoco (Turkey) Jake Jake is the name for an young male turkey. So this was a natural fit for him. Matafari (The Brick) Jared Jared came up with this name for himself. He decided he wanted a different name because people here have trouble saying Jared. Chicajo (Sugar Cane) Jayne Chosen because of how much she likes to eat sugar cane. We have purchased a van for 31 million! (shillings) This is about $13,500. We hope to have it ready to roll by Monday. They are adding seats, a luggage rack on top, and some boda bars on front. These are like “Bull bars” that we use in Oklahoma. This protects the front of your vehicle from the pesky motorcycle taxi guys. If you have some good bars, they try to steer clear of you. This van purchase is the first step in getting our mobile medical clinic on the road! Time is a relative term in Africa. I’ve heard that in the U.S. we have watches and no time, in Africa there are no watches and plenty of time. 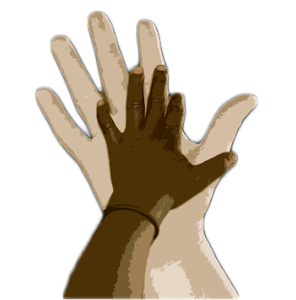 As several people asked how they could pray for us as we were departing the U.S. the first thing that came to mind was for our ability to shift into African time, not only physically, but emotionally, spiritually and mentally as well. The physical adjustment has been smoother than we were anticipating, ironically for the same reason that it is tougher in the other areas. Since we were so busy, (along with the many others who were the hands and feet of Christ to us during our last week at home) packing not only for this trip but our belongings within our home, we were able to shift our sleeping schedule by sleeping very little our last night before we left. This fact coupled with purposeful flight sleeping times, not to mention the prayers, made the physical adjustment fairly painless. Because of the timing of the sale of the house, we have been in the fast pace of our culture on steroids. The temptation here is for this accelerated pace, which feels so normal and ingrained more deeply than one might realize, to allow us to become easily frustrated as we wait. The ironic part is the fast pace of our last week in the United States, made our first week here’s theme: “Hurry up and wait.” So as the temptation arises from time to time as we might sit to wait on a driver, be at a standstill for over an hour in traffic, etc, I am reminded of Psalm 46:10 He says, “Be still, and know that I am God; I will be exalted among the nations, I will be exalted in the earth.” Verse 11 goes on to remind me, “The Lord Almighty is with us; the God of Jacob is our fortress.” I also must remember these verses as I experienced the opposite of what I’ve just described above today as we were in our second day of the medical clinic at Bethany to the outlying villages. Here in Uganda, you have “Break Tea” at about 10:30am and lunch about 1pm. So we closed up the clinic and walked to the home which was providing us lunch. Meanwhile about 75 people continued to wait patiently to be seen by a medical provider, have lab work done, or get their prescription while the clinic was closed over our hour for lunch. Jay commented to me, how tough it was to sit and eat knowing so many were waiting on us. What these beautiful people provided me today was a living example of waiting patiently. Even with all of it, they extended gratitude to us upon their departure from the clinic. Humbling! We will post a diary type blog of day 2 of clinic in Bethany soon! Today, we went to Bethany Village. This is an area across Lake Victoria that is a part of Africa Renewal Ministries. In this area, there are schools, an orphanage, and a medical clinic. We saw 80 kids from their schools today as part of a health screening program. We saw many healthy kids, several with Tinea Capitis (ring worm on the head) and several with cavities in their teeth. Jill and Jared teamed up to take care of registration. They took names and ages. Then they got a weight and height on these beautiful kids. Each of the students was given 5 tablets of worm medicine, which they are required to take 2 times per year. They were not too happy, but none of them refused. ﻿We had a traditional Ugandan lunch in one of the homes. This was probably the best one that we have had to date. Then we got back to work finishing the 80 patients today. We have plans to run a clinic for the Bethany Community tomorrow in which we will likely see 200 patients. Please keep this clinic and the potential health and spiritual healing that could come from it, in your prayers. I would like you to hit your knees for Jonathan. He is a approximately 4 year old boy that we met today in Gaba, prior to crossing the lake to Bethany Village. He has a severe (likely 3rd degree) burn of his R arm and abdomen. This occurred as a pot of boiling water fell on him about a week ago. We were able to pray with Jonathan and his mother. He was given a "free pass" to go to the Wentz Medical Center. He went to Wentz, while we were in Bethany, and had the burn dressed and debrided. His mother has a small stand in the market near the clinic, so I hope to follow him on this burn. It has a high likelihood of getting infected and if that does not happen, it has a high probability of scarring in a way that limits the use of his R arm. I pray that God will heal him in a way that no one can take credit for but God. Please join me in this prayer. God does not need us in Uganda! This weekend we have made a trip to Hoima, Uganda to see Jim’s friend Henry. This is the young man that Jim helped to get freed from prison where he had been incarcerated for 2 years. He had been falsely accused of murder and had spent 2 years in jail, awaiting a trial. 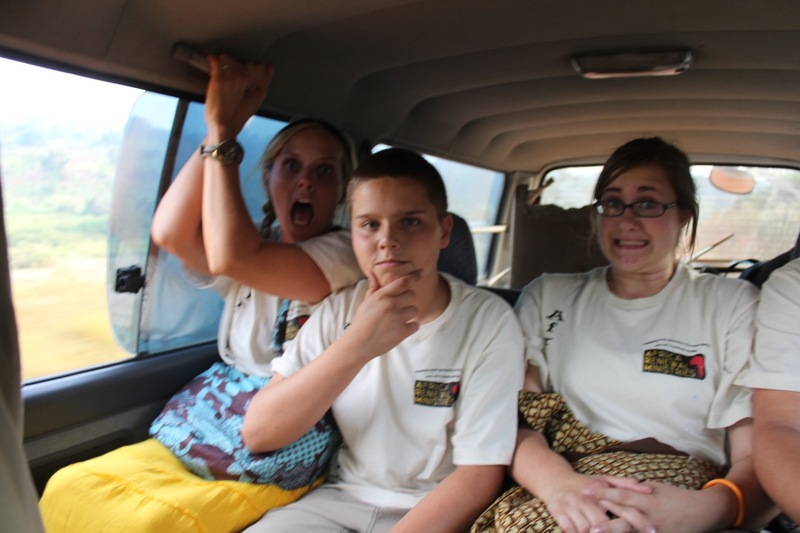 We loaded up in a 11 passenger van and took off Saturday morning for the 4 hour trip to northern Uganda. We had a pretty good trip with only a few obstacles in the road! Yesterday, when we arrived, we went to Henry’s house to meet his family. His mother surprise us with a LARGE traditional Ugandan meal. It was so humbling as they entertained us with sodas, fruits (bananas, papayas, tomatoes), carrots, rice, meat and soup. They spent well more than they should have for us as “honored guests”. We have learned that you eat what they give you as to not eat, would be a sign of dishonor. So we stuffed ourselves. We got tickled because Henry’s brother, Kegan, kept giving us bananas until the whole plate was empty, then he had his sister bring in some more! Luckily, they were quite tasty! Jim, Henry and Tango (our driver) went to look for cows to buy for Henry’s family. They had cows and chickens in the past, but the family was forced to sell them while Henry, his brother and his father were incarcerated unjustly. So some of Jim’s friends had taken up a collection and sent funds to replace the cows, plus more! While they went, we spent some time in Hoima around the markets. We stayed in the Hoima Resort Hotel on Saturday night and got to experience our first night without AC. In addition to this, there is a church next door and I think that they held services all night. I am not complaining, I am just giving you the reasons that I did not sleep very well last night, giving me time to think. Today, we went to worship with Henry’s church. Jim, Henry and Tango went out to seal the deal on the cattle and that left the rest of us at the hotel for a few hours (more time to think). We have really enjoyed some “down time” as it seems like we have been burning the candle on both ends since we arrived. Kegan and Herbert, Henry's brothers, were intrigued by the games on our iPhones and iPads. I fully realize that there is a significant need for medical care in all of Uganda. There is even more of a need in the rural areas. But God does not need us in Uganda! I think that I have the medical training and experience to provide medical care to kids that would otherwise not receive it and suffer when they shouldn’t. But God does not need us in Uganda! People back home have graciously begun to help us fund the mobile medical clinic and make our calling of providing medical care to rural Uganda a reality, but God does not need us in Uganda! We have made many friends and we love the people of Uganda. As a group, they have welcomed the crazy muzungus from Oklahoma with opened arms. We have felt at home and at peace with our recent decisions. But God does not need us in Uganda! We have been working to learn the local language and are happy with the progress we have been making. But God does not need us in Uganda! So if God does not need us in Uganda, what are we doing here? I guess that I should have talked with Jill about this realization before I shared it with you, but I thought that it was important. I read a book recently called “It’s not OK with me” and it’s sequel “Is it OK with you?”. The author helped me come to the above revelation. She also helped me to see that even though God does not need us in Uganda, He loves us enough to let us share in what He is doing in Uganda. The Holy Spirit is off the leash in Uganda! You can feel it palpably when we talk with the people of God that we have contact with. You can sense the Holy spirit in the worship services that we attend. What a blessing to be able to use the medical skills that He has given me. What a blessing to form relationships with the people of Uganda. What a blessing to feel the prayers and support of our Christian friends in the US as we get to share in God’s work that He is doing in Uganda. You know what? God does not need you in Uganda either. He is so big, that he doesn’t need any of us. How awesome is it that he “tolerates” our shortcomings, He loves us and allows us to witness the things that He is up to and join Him where He is working as tools in His hands. Hi, it’s Jared, I’ve been in Uganda for eight days and have realized several things. First, the fruit here is amazing. The second thing is that the people here are awesome. The third thing is that the views here look fake because they are so pretty, and finally the name Jared is hard to pronounce for Ugandans. Okay, the fruit here is great, the pineapples are so good I’ve made my mouth sore multiple times. I don’t think sugar cane is a fruit, but it is great when you chew it. Pears are really good too. I think the people are great. I love the ability to play with the kids, work with Gilbert in the lab at Wentz Clinic, and pray with the people in villages. Having said that, they have stores with no price tags and the minute they see a muzungu the price of anything will go up three times what a local would pay. We have also become friends with David, the security guard, who likes to play soccer, football, and basket ball with us, using our dirty clothes basket and a cheap air-up ball. The views here are spectacular. There are so many, what I call postcard-pictures here, being the the waterfalls, the mountains, and the animals. There are pictures that look so cheesy they look like they are on a green screen at Wal-mart. Finally my name is hard to pronounce for Ugandans because I’ve been called Jo-Ann,Jeremy, and Jerry. Actually, I’ve started introducing myself as Matafari which means brick in Lugandan. We had the privilege of speaking at First Baptist Duncan on the first of January. It was an incredible experience in many ways. The one I want to share with you in this blog came full circle yesterday. At the end of the service, Brad Allen, called our family to the front as well as those who felt led to come down and pray for us before our departure. Jay’s dad then led the time of prayer. As we remained down front, Earl Hunter shared with Jay that his great nephew was a missionary in Uganda. He then gave us a postcard with their picture and information on it. I looked up their website, and Jay shot Micah an email. Micah replied back, sharing that Kara was an RN and might like to join us, time willing, when we go out to some of the rural areas. It seems like we have been very busy since we have arrived. We had made another connection several months back with a gentleman named Steve Bredeson. He is a missionary in Uganda associated with First Methodist in Ardmore. He works with a ministry in Uganda called Eagle’s Nest. Without prior planning on Jay or Steve’s part, we realized a few weeks before we left the States that Steve would be on our flight from Amsterdam to Entebee. When we realized this we made plans to join him and Eagle’s Nest as they went to a village called Nakalanda. Earlier this week, we made plans to join Steve and his team (which we became somewhat acquainted with in the Amsterdam airport) in Gaba and travel to an area called Bethany to this village on Thursday. Eagle’s Nest has a Medical Building in Nakalanda that is a completed structure only. So, Joline, Joshua, and Jennifer joined the five of us and we headed to Gaba. We met up with Steve and his team at their hotel there. As introductions were being made, Steve said, this is Kara. Then he said, this is her baby Abigail, and husband Micah. I said, wait a minute.....I think we’ve shared emails. We are from Oklahoma. Is your great uncle Earl Hunter??? Kara said, I was praying for you guys February 1st, realizing you would be heading to Uganda. I was just waiting to email you to give you a little time to settle in. Instead, here we were together without any effort on either of our parts. Thursday was special to us. After the above described meeting of the Mills family, we boarded a large wooden boat with what appeared to be a 1970 model trolling motor and started off across one of the top ten largest lakes in the world. Luckily, it was a narrow part of the lake and reached the other side in about 30 minutes. Once across, we went down a small canal that had about 6 inches of clearance on either side of our boat. We took this canal about a mile or two back into the jungle. It was straight from Disney World. We then jumped on Boda Bodas (motorcycle taxis) and traveled another 2-3 miles further inland. We stopped at Eagle’s Nest school. We spent the day around the school. We helped hand out care packages to 8 widows and 2 widowers in that village. We got to pray with each of them individually and they were so appreciative. We also got to help feed the kids for lunch and enjoy some great beans and rice. We played chase and soccer with the kids and made many new friends (Jayne especially). They have a clinic building there that was built 2 years ago and has never been used. We may be able to work with Eagle’s nest to host some medical clinics there this year. Thanks a million to Steve Bredesen for introducing us to this wonderful ministry and these beautiful people! After an awesome day in an area that Jay describes as Nat Geo Nowhere, we made the same trek back to Kampala. We took a car to eat dinner with Steve Swigert (from Ardmore) and Brent Smith of Watoto. We got home late again. It seems like our nights keep getting shorter and our days more exciting! Friday, Jay was in the clinic at Gaba and the kids and I were in the babies home! What a delight this was helping to take care of these 22 orphaned children. We had our attempt at Mexican food tonight for dinner. We are going to sleep fast and then off to Hoyma to see Jim’s friend Henry on Saturday and Sunday. Keep the prayers going, we can feel them. Get out of my Boat!